Saul is brought to Samuel. (1-10) Samuel told concerning Saul. (11-17) Samuel's treatment of Saul. (18-27)1-10 Saul readily went to seek his father's asses. His obedience to his father was praise-worthy. His servant proposed, that since they were now at Ramah, they should call on Samuel, and take his advice. Wherever we are, we should use our opportunities of acquainting ourselves with those who are wise and good. Many will consult a man of God, if he comes in their way, that would not go a step out of their way to get wisdom. We sensibly feel worldly losses, and bestow much pains to make them up; but how little do we attempt, and how soon are we weary, in seeking the salvation of our souls! If ministers could tell men how to secure their property, or to get wealth, they would be more consulted and honoured than they now are, though employed in teaching them how to escape eternal misery, and to obtain eternal life. Most people would rather be told their fortune than their duty. Samuel needed not their money, nor would he have denied his advice, if they had not brought it; but they gave it to him as a token of respect, and of the value they put upon his office, and according to the general usage of those times, always to bring a present to those in authority. 11-17 The very maid-servants of the city could direct to the prophet. They had heard of the sacrifice, and could tell of the necessity for Samuel's presence. It is no small benefit to live in religious and holy places. And we should always be ready to help those who are seeking after God's prophets. Though God had, in displeasure, granted Israel's request for a king, yet he sends them a man to be captain over them, to save them out of the hand of the Philistines. He does it, listening graciously to their cry. 18-27 Samuel, that good prophet, was so far from envying Saul, or bearing him any ill-will, that he was the first and most forward to do him honour. 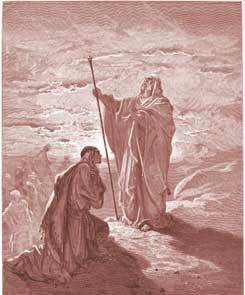 Both that evening and early the next morning, Samuel communed with Saul upon the flat roof of the house. We may suppose Samuel now convinced Saul that he was the person God had fixed upon for the government, and of his own willingness to resign. How different are the purposes of the Lord for us, from our intentions for ourselves! Perhaps Saul was the only one who ever went out to seek asses, and literally found a kingdom; but many have set out and moved their dwellings to seek riches and pleasures, who have been guided to places where they found salvation for their souls. Thus they have met with those who addressed them as if aware of the secrets of their lives and hearts, and have been led seriously to regard the word of the Lord. If this has been our case, though our worldly plans have not prospered, let us not care for that; the Lord has given us, or has prepared us for, what is far better. God is our pillars to our foundations we walk upon,HE created man and land AND the Angels and the Heavens,HE of ALL knows that no matter your Size,Age,Family crest or how much land one posses,HE knows what is best at what time and for what,it is only our own foolishness and fleshy ways that prevents ourselves from remembering that we have choices,but he will always be apart or have the VICTORY!!!. @Tapiwa: In verse 2 (...from his shoulders and upward he was higher than any of the people), this impresses on one that the next tallest person to Saul only reached him at his shoulder level, rather than that Saul had "the longest neck". Bless you. In verse 21 we see that King Saul started off viewing himself in a lowly and humble way. This was one of the reasons why God chose him to be king. GOD chooses those in authority. When Israel asked for a new king, and rejected GOD they asked Samuel, Samuel asked GOD, and GOD chose Saul. HE is still doing that today. Think of the regalia in which Saul is when he leaves home, he is dressed just like his servant is. the attire is probably that of a mere poor herd boy,but only God knows that he has called him to royalty. There are times when we are expected not to worry about the donkeys in our lives. In the olden days Israelites frequented Prophets when faced with adversaries and that way they had a way out of any challenge.It was a taboo or unheard of that they would pay a visit to soothsayers, false prophets, astrologers, miracle workers or people using crystal ball as is the case nowadays. Saul was a righteous person and GOD always remembers the righteous.GOD planned for the donkeys to go astray so that Saul can go looking for it and he will meet with Samuel.There was no place at the table for any more people to eat but Samuel has given him the best seat and the best portion to eat because Saul was a humble person and he was exalted among all the other guest.The bible tells us that GOD resist the proud but gives grace to the humble.He who exalts himself will be humbled and he who humbles himself will be exalted. We do not need to come into conclusion about our selves, friends and neighbours, coz of where they come from, what they are, what they do, there status or coz of the negative cir***stances. Every one has the hidden treasure in them, nomatter the colour. God knows who we are. What Do You Think of 1 Samuel 9? What was the name of Saul's father?